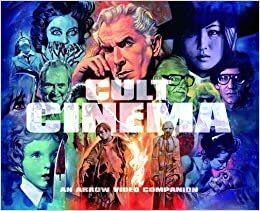 Coming April 4th from Arrow Video is the book Cult Cinema: An Arrow Video Companion, which serves as a nice literary piece to compliment the wonderful Cult films they've been releasing over the past year in the US and past several years in the UK. The wonderful thing about Arrow's discs are that they include booklets - something most companies (the ones who actually still release physical media) have stopped long ago. Arrow also manages to get the most knowledgeable writers on the subject to write these booklets, so this book (which includes reproductions of some of their booklets along with brand new essays) is perfect for cult film fans. Starting with an introduction by filmmaker Ben Wheatley (Kill List, A Field in England), Cult Cinema brings us on a journey through the world of fringe cinema,. Broken into five sections, the book leaves few stones unturned when it comes to all things Cult. The first section focuses on Cult Films, including everything from Roger Corman's gothic classic The House of Usher, Dario Argento's giallo masterpiece Deep Red to Joe Dante's horror comedy The 'burbs. We also get some Fulci, De Palma and Battle Royale. Next sections focus on the directors and actors, including everyone from Cronenberg, Craven, Kaufman (Lloyd that is), to Romero and Karloff, Price, Meiko Kaji and Pam Grier. Lastly, we have Cult sub-genres (Giallo, Spaghetti Westerns, Food Horror, Canuxploitation, etc.) and Distribution (Super 8, Video Nasties to the Asian DVD Explosion). If you don't see your favorite director/actor/sub genre listed above, don't fret. It's probably included somewhere because this massive book has a little bit of everything. Reading about the different sub genres (Pornochanchada!) was really interesting and brought to light many facts I was unaware of. Even the works about directors I have read so much about all had interesting tidbits of information I had never read before. My favorite parts of the book were probably the Video Nasties (which still fascinates and horrifies me and I'm not even in the UK!) and the Christmas Horror sections. This book sold out very quickly over in the UK and probably won't be around much longer in the US, so I suggest you pick up a copy very soon. You won't regret it.